Just Cooking N Baking ....: Rustic Peach Galette ..
* In a medium bowl, whisk together flour, sugar, and salt. Add butter into flour and mix until mixture has a crumbly consistency. * Now add ice water, 1 tablespoon at a time, and mix with a wooden spoon(must) until dough just holds together. DO NOT OVERWORK ON DOUGH. * Wrap dough in a plastic wrap and refrigerate for atleast 10 minutes. * In a medium bowl, whisk together sugar, flour,ginger powder and clove powder. Add in peaches and toss mixture until peaches are coated very well. * Mix all the listed ingridients together and keep it ready to use. * Pre heat the oven to 180 C.
* Pour the filling in center and assemble it giving 1 to 1.5 inch border space. * Fold the 1 inch border of dough over the edges of the peaches and refrigerate for 15 minutes. * Brush the Galette with brushing mixture. * Bake Peach Galette for 25 to 30 minutes in a pre heated oven or until crust is lightly browned. nice one ! Feel free to pop in to my space too when you get the time. Just jotted some tips on"sane motherhood" on my "pick quicks" blog. Lets staty connected beyond the kitchen as well...Hope you will be a follower there.have a great day ! Thank u Ramya, Try and let me know..
Wow! Looks delicious! Love the pictures as well as the wonderful peach filling! You have a lovely blog! Glad to follow you! 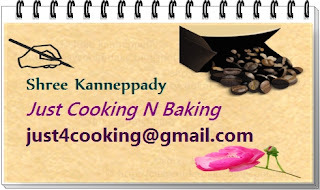 Do visit my space at-http://www.rita-bose-cooking.com/.